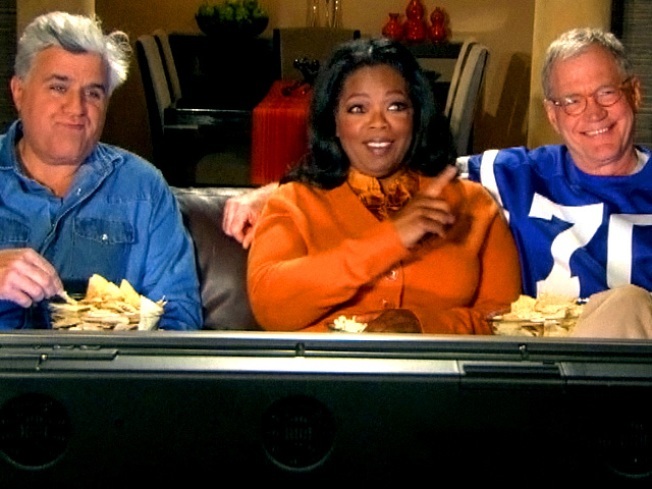 Jay Leno, Oprah Winfrey and David Letterman appeared in an ad depicting Letterman and Leno glumly sharing a couch watching the Super Bowl, with Winfrey seated between them trying to make peace. Super Bowl viewers were rubbing their eyes at the sight of a TV spot pairing CBS late-night host David Letterman with longtime NBC archrival Jay Leno, plus media magnate Oprah Winfrey. Appearing early in the CBS-aired game Sunday, the ad depicted Letterman and Leno glumly sharing a couch watching the Super Bowl, with Winfrey seated between them trying to make peace. 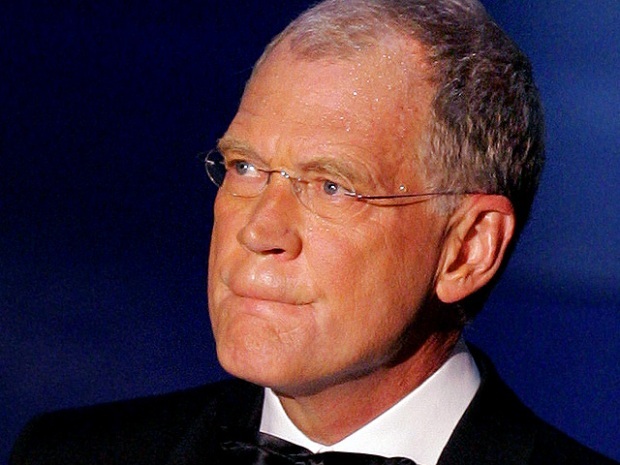 Letterman grumbles, "This is the worst Super Bowl party ever." "Now, Dave, be nice," Winfrey urges. A disgruntled Leno replies that Letterman is only complaining "because I'm here." In a whiny high voice, Dave mocks what Jay has just said. Oprah shakes her head and sighs. That's it. The spot only lasts 15 seconds. It revisited a promo from the 2007 Super Bowl with Letterman and Winfrey watching the big game. But with the surprise addition of Leno, the 2010 version addresses in compact form the talk-show turmoil at NBC, and the soon-to-be-rekindled competition between Letterman and Leno when he reclaims NBC's "The Tonight Show" on March 1. In the age of "Avatar," some viewers might have thought that getting Jay and Dave, plus the super-busy Oprah, together in the same frame was probably accomplished through sophisticated computer-graphic imagery. But no, the spot was produced the old-fashioned way, according to Rob Burnett, executive producer of "Late Show with David Letterman." And it was put together quickly. And very hush-hush. According to Burnett, CBS offered "Late Show" a slot for a promo to air during the Super Bowl. "We said, 'This is too funny to pass up.' First we called Oprah." Then Leno was approached, and he, too, signed on. 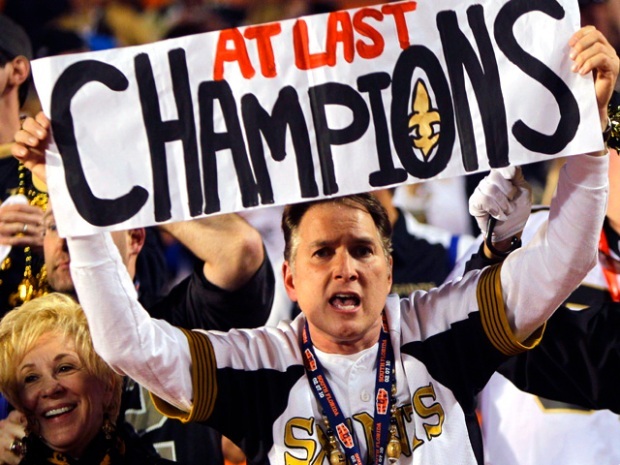 That was two weeks ago. Arrangements had to be made to get the Los Angeles-based Leno and the Chicago-based Winfrey to New York for filming — and do it without word getting out. "Security was a big priority for us," Burnett said. "We really wanted to keep this under wraps. There were a lot of internal logistical conversations about how to even get Jay and Oprah into our building secretly." Filming took less than a half-hour, Burnett said. "It was quick, it was easy," he said. "The attitude was professional and cordial. Dave and Jay were fine with each other." Maybe so. But that very funny, very startling promo has neatly paved the way for a late-night battle between rivals that will resume in just weeks.